Yogshala's 500 Hour YTTC in Pokhara, Nepal. 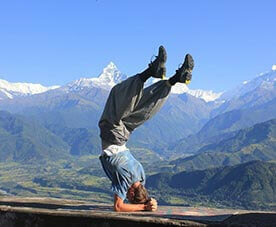 Unearth deeper layers of the yogic science, its system, and discipline amidst snow-laden beauty in the heart of Nepal. Evolve through various stages of the art from novice to advance with Rishikul Yogshala’s 500 Hour Yoga Teacher Training Course In Nepal. Immerse in a completely transformative journey of the mind, body, and spirit in the meditative embrace of Nepal. Feel the cool breeze of fresh air against your skin as you pay homage to some of nature’s most breathtaking treasures. The land of Lord Buddha, the place of eternal evolution for Sage Rishi Nemi, the breathtaking country of Nepal calls out the driven and the dedicated ones to immerse in deeply authentic and traditional teachings of yoga and meditation. Embark upon the inward journey of the art under the esteemed shadow of evolved yoga teachers and mentors. The country has been a nurturer of several yoga and meditation gurus who set foot on this divine land in order to submit themselves to the learning and practice of this science. 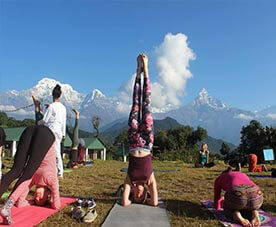 Several yogis travel from India and set a second home in the lap of Nepal for mental and spiritual salvation. 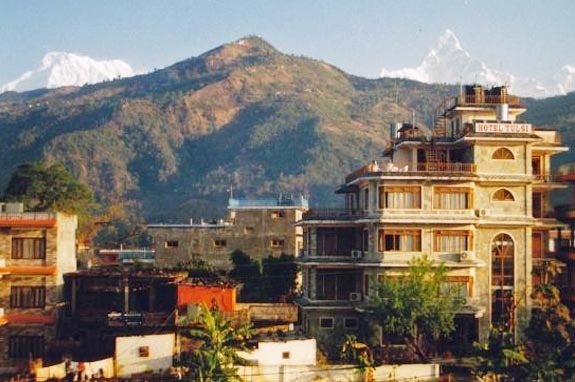 The country is flourished with old historic pagodas, gompas, Hindu temples, that offer quaint serenity and wisdom in its purest form to the wandering yogis.It is a perfect destination to immerse in enriching yogic practices through various stages the 500 Hour Yoga Certification In Nepal entails while dwelling in the soulful ambiance of the Himalayan country. Owing to these reasons, it is one of Rishikul Yogshala’s most beloved branches offering 500 Hour Yoga program. 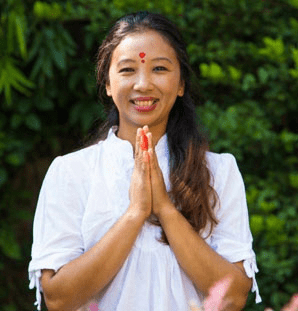 Take the ideal step towards complete evolution into a yoga teacher and serious practitioner of the art with our 500 Hour Yoga Alliance Teacher Training In Nepal. Travel to the country of Nepal and bookmark it for life as you emerge as a complete yogi in its soulful embrace. As the title suggests, a 500 hour yoga program is an ideal blend of 200 hour and 300 hour yoga teacher training courses. 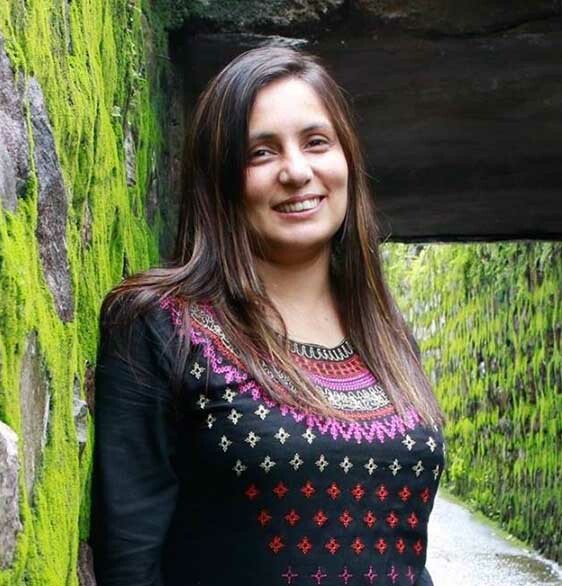 Wherein the first segment of the program allows you to embark on the path of yoga and to build your life inspired by the yogic science through a highly-immersive curriculum, the second-half segment aims to advance the knowledge and practice of the existing yogis through a higher level yoga teachings. Our 500 hour yoga program is ideal for all those who wish to firm their roots in this glorious science and graduate as a yoga teacher with utmost priority, excellence, and skills. The entire course of the 500 Hour Yoga TTC in Nepal is well-crafted according to the guidelines set by Yoga Alliance USA and Yoga Alliance International, molded to perfection by our qualified yoga teachers. The program is followed by strict discipline and is formulated to immerse you in various aspects of classical yoga with authenticity and magnificence. Get trained both theoretically and practically as you comprehend deeply into the study of various traditional topics such as Hatha Yoga, Ashtanga Yoga, Yoga Anatomy, Adjustment and Alignment and so much more disseminated through different mediums like workshops, practicum, guided sessions, etc. In addition to this, we offer timely breaks which include excursions that help our students refresh and revive their mind and body while they are undergoing a rigorous program. 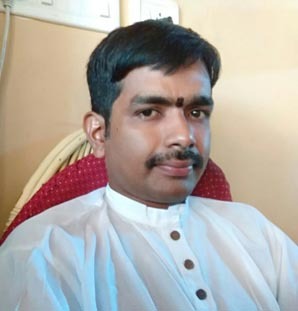 During the course, you would learn the techniques of modifying the various yoga asanas in order to savor precise benefits and intended advantages. While the higher classes of teaching methodology shall give you an insight into the techniques of becoming a refined yoga teacher. 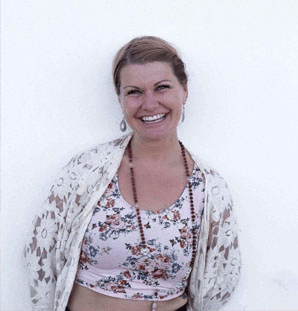 As a yoga teacher and practitioner, 500 Hour Yoga Teacher Training Certification is recognized as the highest level of the certification program in yoga. Owing to our recognition with the prestigious Yoga Alliance, we provide our 500 Hour YTTC graduates the opportunity and privilege to teach and preach the art of yoga from basic level to advanced level across the globe. With this certification, you shall be recognized among some of the finest advanced level Yoga teachers and practitioners. 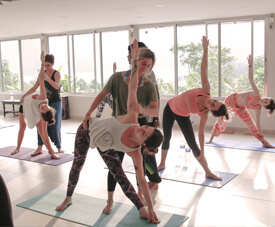 In addition, we also have a team of Assistant Yoga Teachers assigned during the course of the yoga program who take you through a safe and enlightening journey of yoga and spirituality. Travelling miles away from home can be quite thrilling. However, when it comes to a resting place, nothing feels as great as home. We definitely level with this fact. And, so we put in our best efforts to provide you with a cozy and comfortable stay and an atmosphere that can help you feel at home, only more quaint, natural and unique. 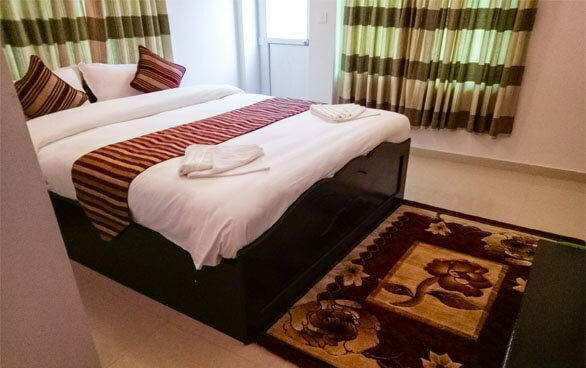 We place our students in neat, cozy accommodation that is furnished with wooden work for earthen feel, facilitated with all the modern amenities such as twin beds, TV, geyser, attached washrooms, private seating area, lights, fans, etc. This is not all. We understand how vital it is for our yogis to be at a place where they can feel inspired and self-reflect. 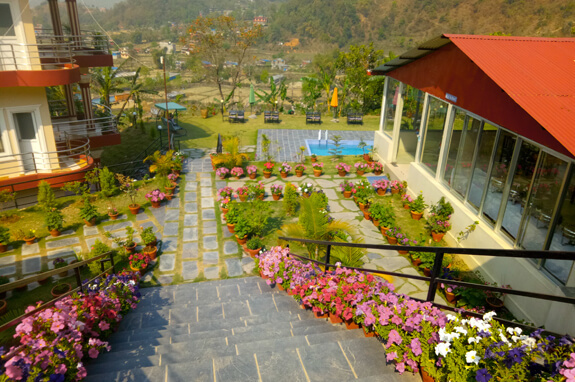 Surrounded by the magnificent sparkling beauty of the Annapurna Range, with humming river streams at the bottom, lustrous gardens, our venue in Nepal is all set to enrich your heart and soul with its tranquil appeal and mesmeric ambiance. 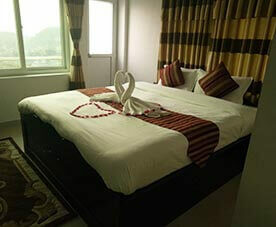 We offer both private and twin sharing rooms to the students. 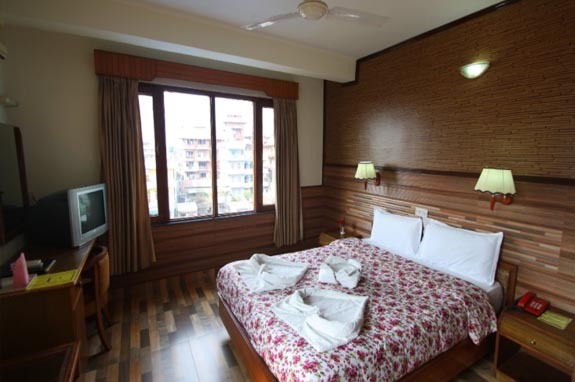 Air-conditioned rooms can be availed at additional charges. Fresh fruits, succulent salads, freshly sourced vegetables cooked to perfection in healing herbs and Ayurvedic recipes, the food platter served to our students at Rishikul Yogshala is a delight for mind and the body both.While undergoing the rigorous curriculum of 500 Hour Yoga Instructor Training In Nepal, a well-nourished body and a well-fed soul is of the essence. We, at Rishikul Yogshala level with this fact and so, we only serve wholesome yogic meals to our students endowed with healing and restorative properties. 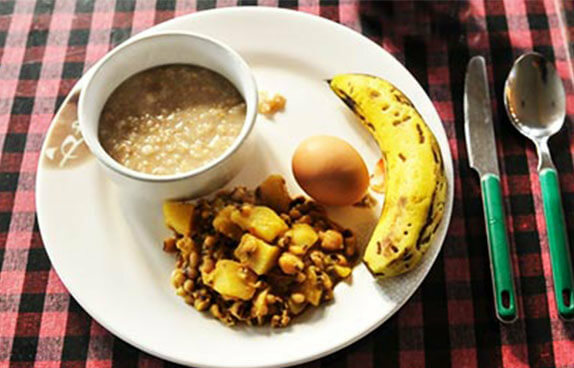 The food is prepared from fresh produce sourced from the plush agricultural fields, a few miles from our venue and, is beautifully prepared by our professional chefs with specialization in Ayurveda cuisine. Along with serving balanced yogic meals, we also serve herbal drinks as accompaniments. If you have a special inclination for vegan choices, then we are more than happy to accommodate the same. However, we would appreciate if we are notified of the same in prior. A glorious night’s stay in Sarangkot on full moon day. A panorama that drifts an entity into a magical outer space, a place secluded from rest of the civilization that is eminent for its enchanting beauty and serene environment looks exceptionally magical on a full moon day. Spending a night at this place on a full moon marks an experience of a lifetime which can only be cherished like an immortal memory in the heart and soul of an entity. By Airway : Connected internationally, the closest airport would be Tribhuvan airport in Kathmandu. Multiple flights from various destinations run to and from Kathmandu. 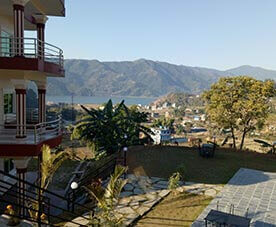 One can land at the international airport in Kathmandu and take a bus or car ride to Pokhara. 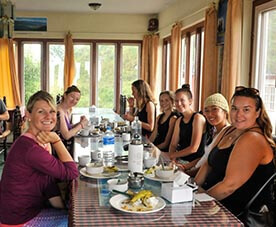 Enliven a truly enlightening yogic experience in one of the globe’s most breathtaking and adventurous destinations. Preach the majestic science of yoga anywhere on the globe as one of the finest yoga instructors exhibiting advanced knowledge and skills in the art of yoga. Evolve into a full-fledged yoga teacher and practitioner traveling through various stages of the science. Earn the right and privilege to attain the authentic forms of yoga under the esteemed guidance of globally recognized yoga teachers and mentors. Gain in-depth knowledge of the yoga philosophy and its system. Imbibe the pragmatic way of life towards the complete enrichment of the mind, body, and soul. Move through various series and types of yoga poses from basic to advanced while avoiding injury. Acquire the skills to mold and modify the yoga practice and asanas according to the requirement and for attaining enhanced benefits. Exercise the ability to heal and restore while healing others. Engage in soulful interactions and discussion with fellow yogis and like-minded individuals. Establish bonds of a lifetime! 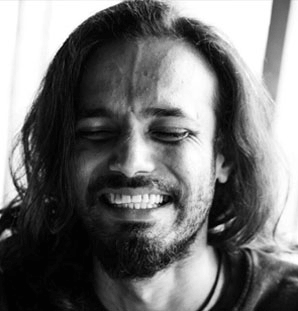 Evolve as the finest yoga teacher with expertise in teaching a range of subjects under 200 Hour, 300 Hour and 500 Hour. Peel the layers of your inner being towards self-realization and rejuvenation.